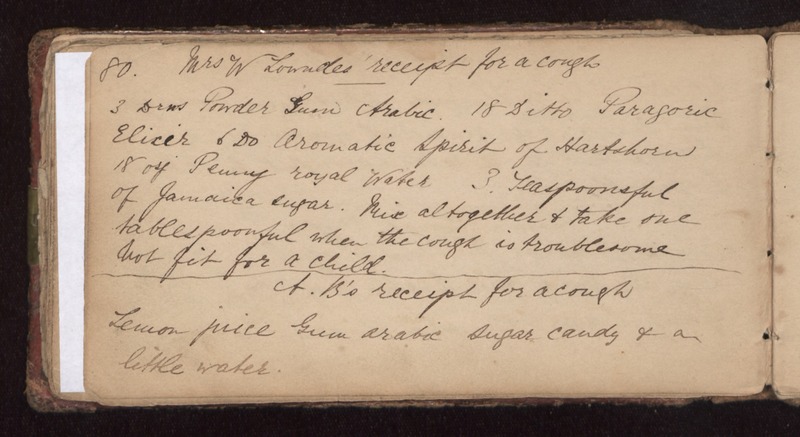 Mrs W Lowndes receipt for a cough 3 drms powder gum arabic. 18 ditto paragoric elicir 6 do aromatic spirit of hartshorn 18 oz penny royal water 3 teaspoonsful of Jamaica sugar. Mix altogether & take on tablespoonful when the cough is troublesome not fit for a child. A. B's receipt for a cough Lemon juice gum arabic sugar candy & and a little water.